Car key is a common thing in daily life, it is normal to put a car key on poker table when you playing cards game. Car key scanning poker camera is for those who are adventurous. Benz juice deck car key scanner has one poker lens inside, its scanning distance is from 20 to 30 cm(the scanning distance is customizable), as long as you use it within this working distance, our Benz car key scanning camera can scan out the luminous ink barcode marking in 0.1 second, fast and precise. Benz barcode playing cards car key camera use with poker analyzer, such as CVK 350 poker analyzer, they are set of poker cards scanning system, can report you the Omaha game winners; moreover, it can report to you each playing cards from up to down or in opposite direction with cards pips and suits. 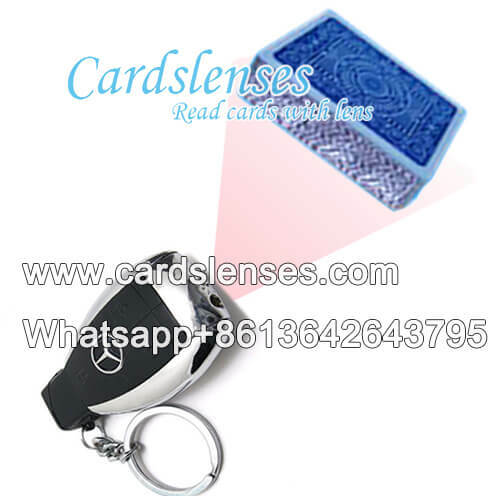 This Benz car key barcode marked deck scanner is suitable in Texas Holdem, Omaha, Blackjack, Baccarat and other casino games.